A single central medallion design with 16 satellite "eggs" around the center, with multiple borders. The carpet is so detailed that it is almost hard to refer to the "field" as blue in the center, because there are so many floral objects filling up the field. Vast array of complex, integrated colorations throughout the design. Considered the most perfect type of Persian rug ever made from the classical 16th century period. There is another similar carpet in the Los Angeles County Museum of Art, that is considered its twin. 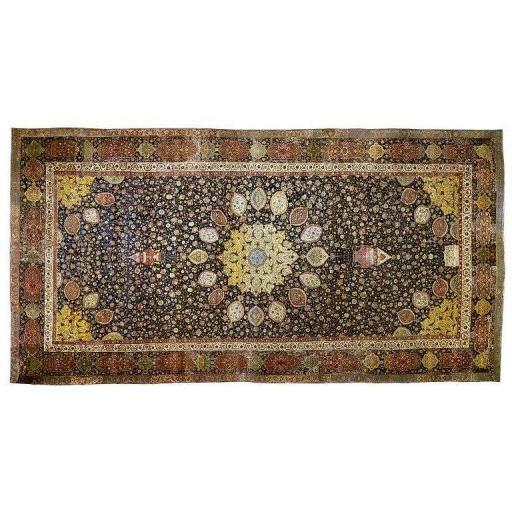 This carpet was done during the rule of Safavid Shah Tahmasp I. Probable location of production: Tabriz.